The cybercrime war: when are we going to win? Why are information security issues so persistent? Why does it feel like we win small battles, yet the war keeps escalating? After 20 odd years of serious fighting we need to ask, what does the next 20 look like? Join Erik Petersen, Vice President of Security and Risk Consulting at Dell SecureWorks as he discusses micro and macro-economic theory to grapple with the core questions of “why”. •Why is information security so hard? •Why is the outlook so depressing? •Why didn’t we make better security decisions along the way? In this discussion we aren’t going to tell you how to magically fix the problem of security…but we will explain your suffering. 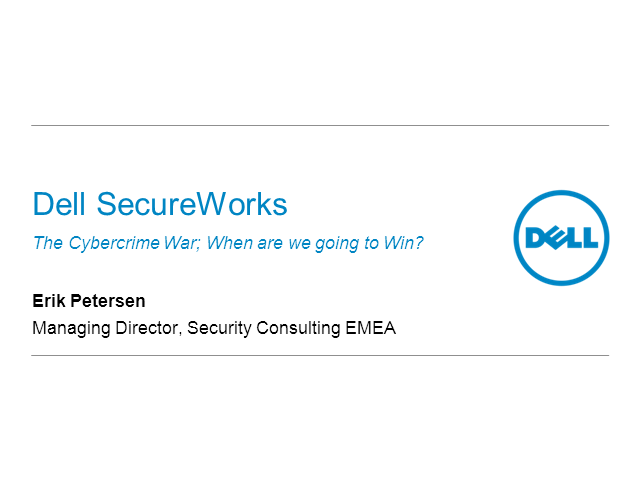 Erik Petersen is the Vice President of Security and Risk Consulting at Dell SecureWorks. He is a risk management and IT control expert who has led teams and built professional consulting practices that specialise in applying sound risk management and information security best practices for organisations seeking to manage their business risks. Title: The cybercrime war: when are we going to win?